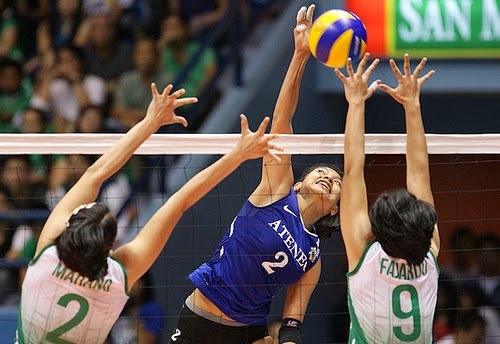 Ateneo beat La Salle to win first UAAP Women’s Volleyball Championship - Balita Boss! The Ateneo Lady Eagles beat the defending champion and rival De La Salle Lady Spikers in Game 4 of the UAAP Women’s Volleyball Finals to claim their first ever league title. The Lady Eagles swept the Lady Spikers, winning three consecutive sets with scores of 25-23, 26-24, 25-21. The Ateneo women’s volleyball team came out to steal the title from the De La Salle women’s volleyball team, who were dreamed to win a record four-peat championship. UAAP Season 76 Women’s Volleyball Most Valuable Player (MVP) Alyssa Valdez led Ateneo on their historic and successful victory against the top-seeded La Salle in the Finals. She also declared as the finals MVP to add to her growing collection of awards. In game 4, Valdez scored the last three points and finished with 21 points helping the ADMU to an improbable upset overcoming the thrice-to-beat advantage of DLSU. Ateneo’s rookie Michele Morente and Ella de Jesus also contributed posting 11 and 10 points, respectively. Ara Galang, last season’s co-MVP, topscored for La Salle with 11 points. Graduating Aby Marano ended her UAAP stint with eight points. Ateneo – Valdez 21, Morente 11, De Jesus 10, Ahomiro 6, Morado 4, Patnongon 1. La Salle – Galang 11, Marano 8, Tan 7, Demecillo 6, Reyes 6, Fajardo 2, Cerveza 1, Cheng 1.